I hitchhiked with about eight different people for about 30km that day. 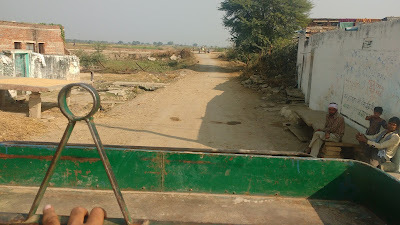 I hitchhiked on motor-bikes, on mini-trucks having traces of animal-waste, a rickshaw, a jeep and on a tractor. I hitchhiked for distances ranging from 300m to 10km. I had my lunch of roti-sabzi laden with desi ghee on a khat (cot) outside a small house in the middle of nowhere. 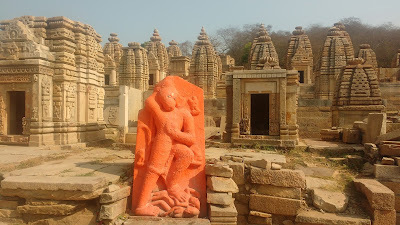 That day I hitchhiked from the village of Bamore, a little to the north of Gwalior, to Bateshwar, Padhawali and Mitawali and then returned via Rithora and Malanpur. The day's exploits were certainly rewarded with not only some amazing monuments, but also a good insight to the lives of the people. All this happened, as I later learnt, in a region which until 2005 was the last stronghold of the feared dacoits of the Chambal ravine. Hindsight says it was an incredibly stupid idea. 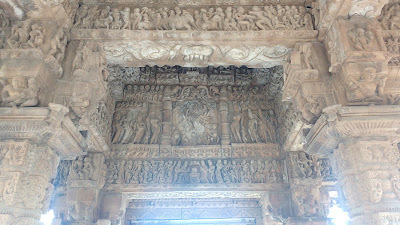 The Bateshwar Temple complex was my first stop for the day. 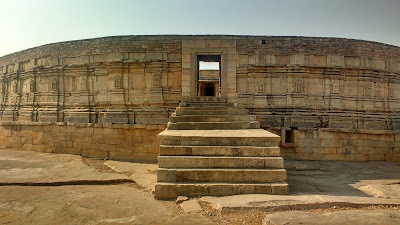 This site has a staggering 221 temples from the sixth through ninth centuries bunched together in an area of not more than 5-6 acres. 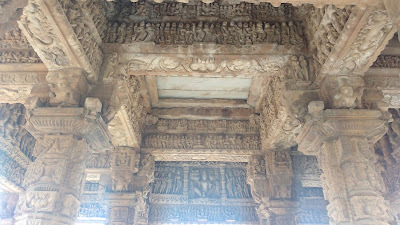 These temples, attributed to the Pratihara dynasty, have been painstakingly renovated by the ASI. The site has a resident caretaker who can show you around the complex. 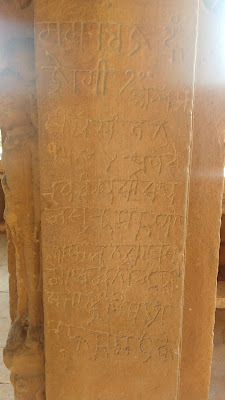 Also ask for the album that details the restoration efforts by the ASI at the site post 2005. 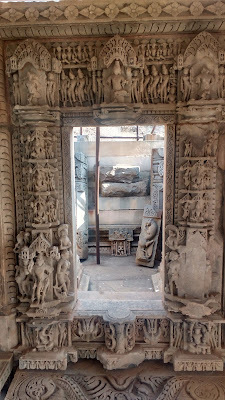 The scale of restoration here is a testament to what ASI could achieve if left to do its job without interference. 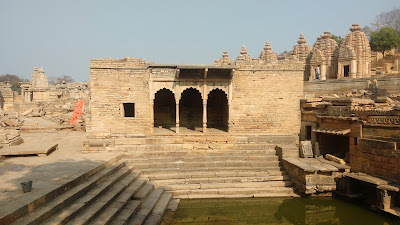 A few kilometers down the road from Bateshwar is the Garhi Padhavali. 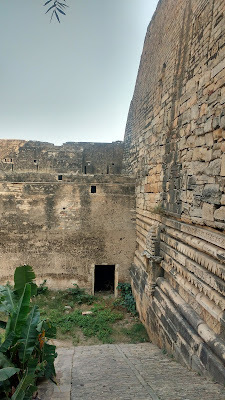 The structure is predominantly a fort (garhi) built in the nineteenth century by local rulers. 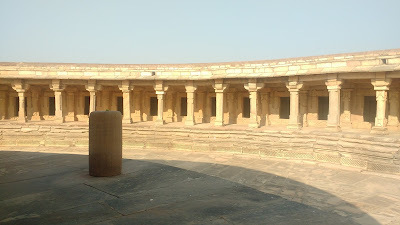 The fort is built around what was once an ornate temple. 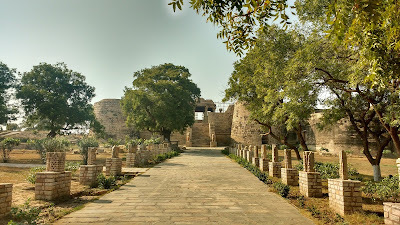 The fort has regular defenses and has a section which was once used as a jail. 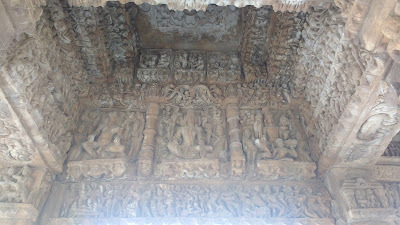 As for the temple, only the elevated Mukhamandapa (outer hall) remains, the sanctum having long been destroyed during the Islamic invasions. 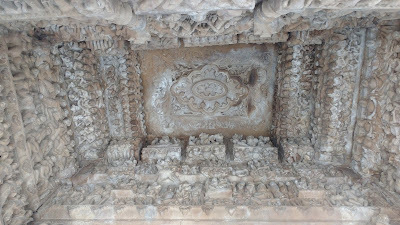 But even this, the crumbling hall, is so intricately carved that one only craves to imagine what the original temple would have been like. 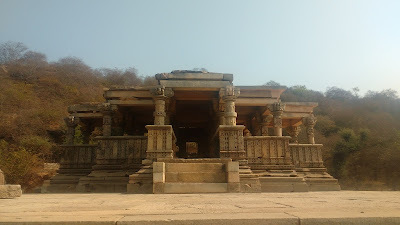 The temple is attributed to lord Shiva and considered to have been constructed in the tenth century. Welcome to the Indian Parliament - or at least the building which the locals say it is based on. 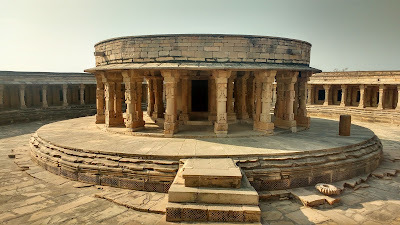 The building has the circular architecture of the Chausath Yogini format - the main temple occupies the centre of the circle, while numerous small temples occupy the circumference, each in turn opening in to face the main temple. 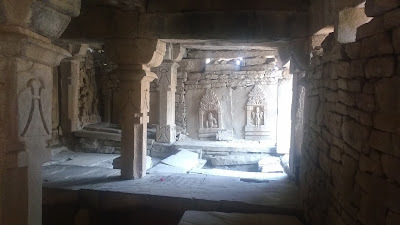 The main temple and some of the circumferential ones have shivlings, while others are empty. 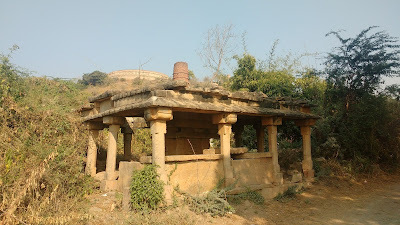 The temple is located on top of a hillock and has views of the surrounding countryside. 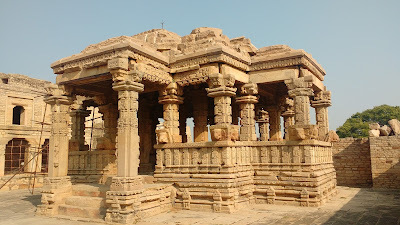 The construction of this temple is attributed to the Kachchhapaghata dynasty, at about 14th century. 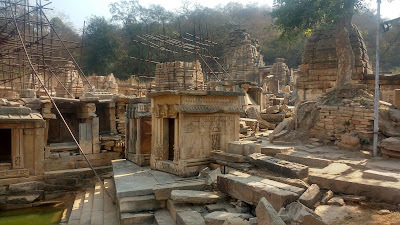 The village of Mitawali at the base of the hillock itself has been a location where numerous beautiful artifacts have been unearthed. 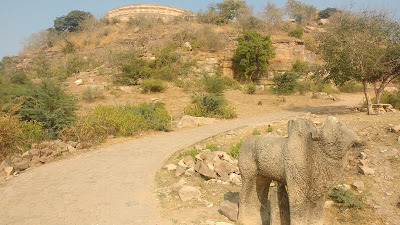 One statue of a cow watches over the path that leads to the temple, while the others are now displayed at the ASI museum inside Gwalior Fort. 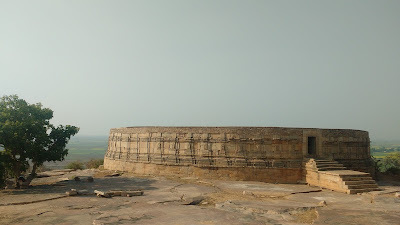 Bateshwar, Padhavali ad Mitavali are located close to each other and about 30km from Gwalior which is the main access point. 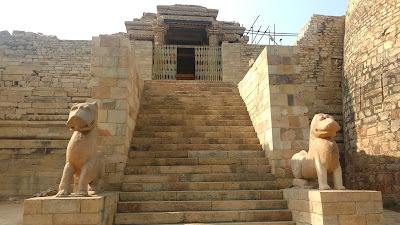 From Gwalior, one can approach the places via Bamore and Nurabad in the north or Malanpur-Rithora in the east. 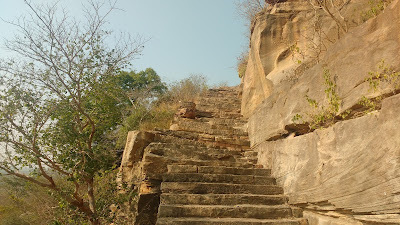 The eastern access is the most preferred as there are frequent connections on this route at least till Rithora which is about 5km from Padhavali. This was the route I took for my return journey. The route from Bamore on which I had set off, is mainly used by the numerous mining quarries that have occupied this area after 2005 and also tourists with vehicles. 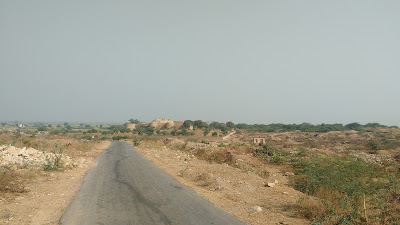 The road is understandably narrow and winding with the scrub-land terrain. In all good sense, keep away from this road unlike what I did. Well, been there - done that. 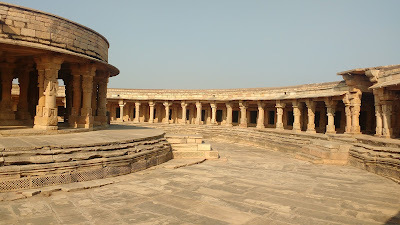 Head to these off the route places when you are somewhere near Gwalior. 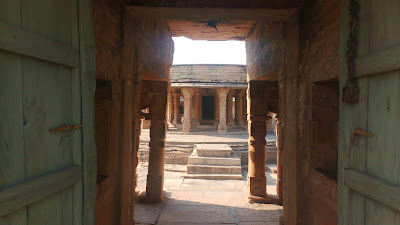 These places are beautiful, but have been relegated to the lost chapters of history due to the prevailing situations. Now is the time to give these a chance. Let them enthrall you enmasse. 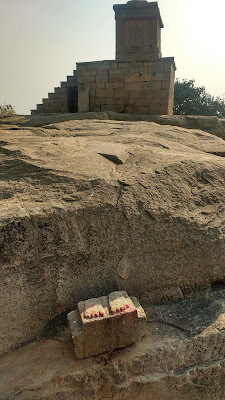 Also, if you happen to come here with a dedicated transport, then do give Kakanmath a go (25km further) or Naresar even, though I've not yet been to either. Give it a go still!